The application has been designed using common patterns, such as the ones defined within the "classic" "Designs Patterns" by Erich Gamma et al. and "Pattern of Enterprise Application Architecture", by Martin Fowler; though not required, these lectures are strongly recommended. Guys! 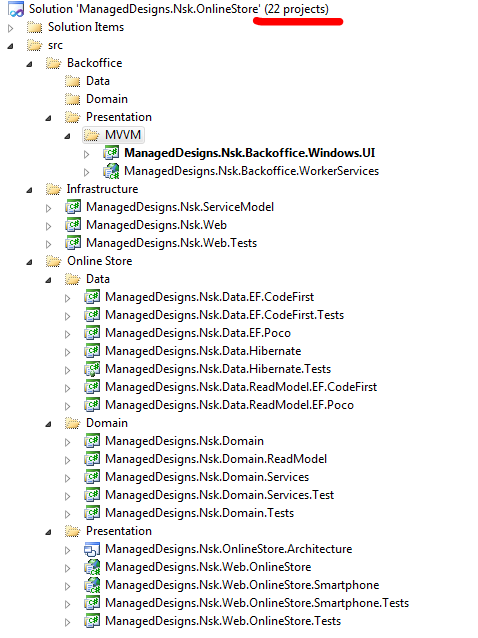 This is Northwind, the likelihood that you’ll need design patterns to build this application is nil to none! That just screens complexity overload. Northwind is a CRUD app, at its core, all of those things are adding complexity, and they aren’t really adding much at all. In fact, they are going to create just noise, and make working with things that much harder. I mean, really? Seriously?! 22(!) projects to do a sample application using Northwind? I really like how the Update method does what it is meant to do, right? Note that in either implementation, we are looking at totally and drastically different behavior. The design is straight out of Patterns of Enterprise Application Architecture, and it is totally the wrong design to be using if you are using a modern OR/M. Seriously, this is Northwind we are talking about, why make things so freaking complex? !